Falling oil prices could mean rising global conflict. As 2015 drew to a close, many in the global energy industry were praying that the price of oil would bounce back from the abyss, restoring the petroleum-centric world of the past half-century. All evidence, however, points to a continuing depression in oil prices in 2016—one that may, in fact, stretch into the 2020s and beyond. Given the centrality of oil (and oil revenues) in the global power equation, this is bound to translate into a profound shakeup in the political order, with petroleum-producing states from Saudi Arabia to Russia losing both prominence and geopolitical clout. To put things in perspective, it was not so long ago—in June 2014, to be exact—that Brent crude, the global benchmark for oil, was selling at $115 per barrel. Energy analysts then generally assumed that the price of oil would remain well over $100 deep into the future, and might gradually rise to even more stratospheric levels. Such predictions inspired the giant energy companies to invest hundreds of billions of dollars in what were then termed “unconventional” reserves: Arctic oil, Canadian tar sands, deep offshore reserves, and dense shale formations. It seemed obvious then that whatever the problems with, and the cost of extracting, such energy reserves, sooner or later handsome profits would be made. It mattered little that the cost of exploiting such reserves might reach $50 or more a barrel. As of this moment, however, Brent crude is selling at $33 per barrel, one-third of its price 18 months ago and way below the break-even price for most unconventional “tough oil” endeavors. Worse yet, in one scenario recently offered by the International Energy Agency (IEA), prices might not again reach the $50 to $60 range until the 2020s, or make it back to $85 until 2040. Think of this as the energy equivalent of a monster earthquake—a pricequake—that will doom not just many “tough oil” projects now underway but some of the over-extended companies (and governments) that own them. The current rout in oil prices has obvious implications for the giant oil firms and all the ancillary businesses—equipment suppliers, drill-rig operators, shipping companies, caterers, and so on—that depend on them for their existence. It also threatens a profound shift in the geopolitical fortunes of the major energy-producing countries. Many of them, including Nigeria, Saudi Arabia, Russia, and Venezuela, are already experiencing economic and political turmoil as a result. (Think of this, for instance, as a boon for the terrorist group Boko Haram as Nigeria shudders under the weight of those falling prices.) The longer such price levels persist, the more devastating the consequences are likely to be. During the go-go years of the housing boom, in the early part of this century, the world economy was thriving, demand was indeed soaring, and many analysts were predicting an imminent “peak” in world production followed by significant scarcities. Not surprisingly, Brent prices rose to stratospheric levels, reaching a record $143 per barrel in July 2008. With the failure of Lehman Brothers on September 15 of that year and the ensuing global economic meltdown, demand for oil evaporated, driving prices down to $34 that December. This is more or less where things stood in early 2014, when the price pendulum suddenly began swinging in the other direction, as production from unconventional fields in the United States and Canada began to make its presence felt in a big way. Domestic US crude production, which had dropped from 7.5 million barrels per day in January 1990 to a mere 5.5 million barrels in January 2010, suddenly headed upwards, reaching a stunning 9.6 million barrels in July 2015. Virtually all the added oil came from newly exploited shale formations in North Dakota and Texas. Canada experienced a similar sharp uptick in production, as heavy investment in tar sands began to pay off. According to BP, Canadian output jumped from 3.2 million barrels per day in 2008 to 4.3 million barrels in 2014. And don’t forget that production was also ramping up in, among other places, deep-offshore fields in the Atlantic Ocean off both Brazil and West Africa, which were just then coming on line. At that very moment, to the surprise of many, war-torn Iraq succeeded in lifting its output by nearly one million barrels per day. Add it all up and the numbers were staggering, but demand was no longer keeping pace. The Chinese stimulus package had largely petered out and international demand for that country’s manufactured goods was slowing, thanks to tepid or nonexistent economic growth in the United States, Europe, and Japan. From an eye-popping annual rate of 10 percent over the previous 30 years, China’s growth rate fell into the single digits. Though China’s oil demand is expected to keep rising, it is not projected to grow at anything like the pace of recent years. At the same time, increased fuel efficiency in the United States, the world’s leading oil consumer, began to have an effect on the global energy picture. At the height of the country’s financial crisis, when the Obama administration bailed out both General Motors and Chrysler, the president forced the major car manufacturers to agree to a tough set of fuel-efficiency standards now noticeably reducing America’s demand for petroleum. Under a plan announced by the White House in 2012, the average fuel efficiency of US-manufactured cars and light vehicles will rise to 54.5 miles per gallon by 2025, reducing expected US oil consumption by 12 billion barrels between now and then. In mid-2014, these and other factors came together to produce a perfect storm of price suppression. At that time, many analysts believed that the Saudis and their allies in the Organization of the Petroleum Exporting Countries (OPEC) would, as in the past, respond by reining in production to bolster prices. However, on November 27, 2014—Thanksgiving Day—OPEC confounded those expectations, voting to maintain the output quotas of its member states. The next day, the price of crude plunged by $4 and the rest is history. Aside from the continuing economic slowdown in China and the surge of output in North America, the most significant factor in the unpromising oil outlook, which now extends bleakly into 2016 and beyond, is the steadfast Saudi resistance to any proposals to curtail their production or OPEC’s. On December 4, for instance, OPEC members voted yet again to keep quotas at their current levels and, in the process, drove prices down another 5 percent. If anything, the Saudis have actually increased their output. Many reasons have been given for the Saudis’ resistance to production cutbacks, including a desire to punish Iran and Russia for their support of the Assad regime in Syria. In the view of many industry analysts, the Saudis see themselves as better positioned than their rivals for weathering a long-term price decline because of their lower costs of production and their large cushion of foreign reserves. The most likely explanation, though, and the one advanced by the Saudis themselves is that they are seeking to maintain a price environment in which US shale producers and other tough-oil operators will be driven out of the market. “There is no doubt about it, the price fall of the last several months has deterred investors away from expensive oil including US shale, deep offshore, and heavy oils,” a top Saudi official told the Financial Times last spring. Despite the Saudis’ best efforts, the larger US producers have, for the most part, adjusted to the low-price environment, cutting costs and shedding unprofitable operations, even as many smaller firms have filed for bankruptcy. As a result, US crude production, at about 9.2 million barrelsper day, is actually slightly higher than it was a year ago. 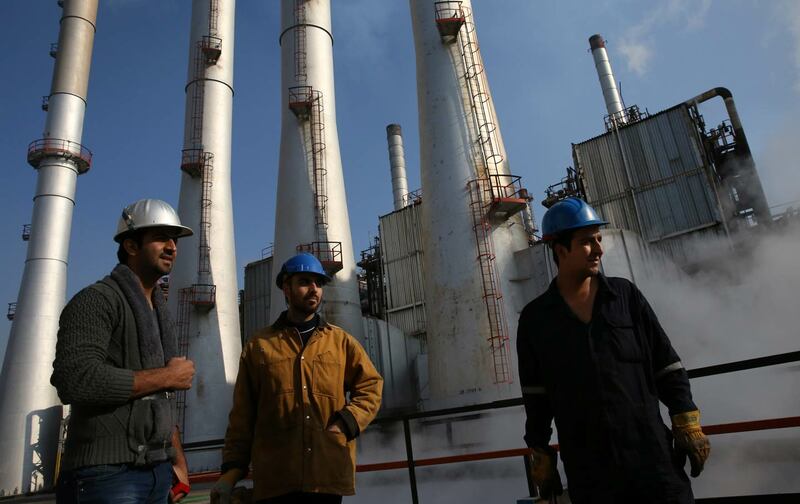 For years, Iranian production has been hobbled by sanctions imposed by Washington and the European Union, impeding both export transactions and the acquisition of advanced Western drilling technology. Now, thanks to its nuclear deal with Washington, those sanctions are being lifted, allowing it both to reenter the oil market and import needed technology. According to the US Energy Information Administration, Iranian output could rise by as much as 600,000 barrels per day in 2016 and by more in the years to follow. The prospect of a new war between, say, Iran and Saudi Arabia—two powers at each other’s throats at this very moment—can never be ruled out, though neither side is believed to have the capacity or inclination to undertake such a risky move. A Saudi decision to constrain production is somewhat more likely sooner or later, given the precipitous decline in government revenues. However, the Saudis have repeatedly affirmed their determination to avoid such a move, as it would largely benefit the very producers—namely shale operators in the United States—they seek to eliminate. While newly affluent consumers in China and India continue to buy oil-powered automobiles—albeit not at the breakneck pace once predicted—a growing number of consumers in the older industrial nations are exhibiting a preference for hybrid and all-electric cars, or for alternative means of transportation. Moreover, with concern over climate change growing globally, increasing numbers of young urban dwellers are choosing to subsist without cars altogether, relying instead on bikes and public transit. In addition, the use of renewable energy sources—sun, wind, and water power—is on the rise and will only grow more rapidly in this century. Nigeria’s government, for example, traditionally obtains 75 percent of its revenues from such sales; Russia’s, 50 percent; and Venezuela’s, 40 percent. With oil now at a third of the price of 18 months ago, state revenues in all three have plummeted, putting a crimp in their ability to undertake ambitious domestic and foreign initiatives. In Nigeria, diminished government spending combined with rampant corruption discredited the government of President Goodluck Jonathan and helped fuel a vicious insurgency by Boko Haram, prompting Nigerian voters to abandon him in the most recent election and install a former military ruler, Muhammadu Buhari, in his place. Since taking office, Buhari has pledged to crack down on corruption, crush Boko Haram, and—in a telling sign of the times—diversify the economy, lessening its reliance on oil. Venezuela has experienced a similar political shock thanks to depressed oil prices. When prices were high, President Hugo Chávez took revenues from the state-owned oil company, Petróleos de Venezuela SA, and used them to build housing and provide other benefits for the country’s poor and working classes, winning vast popular support for his United Socialist Party. He also sought regional support by offering oil subsidies to friendly countries like Cuba, Nicaragua, and Bolivia. After he died in March 2013, his chosen successor, Nicolas Maduro, sought to perpetuate this strategy, but oil didn’t cooperate and, not surprisingly, public support for him and for Chávez’s party began to collapse. On December 6, the center-right opposition swept to electoral victory, taking a majority of the seats in the National Assembly. It now seeks to dismantle Chávez’s “Bolivarian Revolution,” though Maduro’s supporters have pledged firm resistance to any such moves. The situation in Russia remains somewhat more fluid. President Vladimir Putin continues to enjoy widespread popular support and, from Ukraine to Syria, he has indeed been moving ambitiously on the international front. Still, falling oil prices combined with economic sanctions imposed by the European Union and the United States have begun to cause some expressions of dissatisfaction, including a recent protest by long-distance truckers over increased highway tolls. Russia’s economy is expected to contract in a significant way in 2016, undermining the living standards of ordinary Russians and possibly sparking further anti-government protests. In fact, some analysts believe that Putin took the risky step of intervening in the Syrian conflict partly to deflect public attention from deteriorating economic conditions at home. He may also have done so to create a situation in which Russian help in achieving a negotiated resolution to the bitter, increasingly internationalized Syrian civil war could be traded for the lifting of sanctions over Ukraine. If so, this is a very dangerous game, and no one—least of all Putin—can be certain of the outcome. Saudi Arabia, the world’s leading oil exporter, has been similarly buffeted, but appears—for the time being, anyway—to be in a somewhat better position to weather the shock. When oil prices were high, the Saudis socked away a massive trove of foreign reserves, estimated at three-quarters of a trillion dollars. Now that prices have fallen, they are drawing on those reserves to sustain generous social spending meant to stave off unrest in the kingdom and to finance their ambitious intervention in Yemen’s civil war, which is already beginning to look like a Saudi Vietnam. Still, those reserves have fallen by some $90 billion since last year and the government is already announcing cutbacks in public spending, leading some observers to question how long the royal family can continue to buy off the discontent of the country’s growing populace. Even if the Saudis were to reverse course and limit the kingdom’s oil production to drive the price of oil back up, it’s unlikely that their oil income would rise high enough to sustain all of their present lavish spending priorities.